The guys were very fond of their original website – the simplicity and space allowed the Kavaleer work to shine through. But they wanted to take advantage of wider screens, move to a CMS and show off their work to max. They were delighted with the result – a fresh, bright canvas with which to showcase animation, design and illustration and their app developments. The original Kavaleer website was created in html only and so was difficult to keep up the pages up to date. However they did have a great little WordPress blog going for the news/blog area of the website which they updated frequently. They were quite pleased to know that alongside a new design we’d also be utilising WordPress for the content management of all the website and they could continue using a familiar tool. As you might imagine Kavaleer have a good body of animated work, not to mention a wonderful back catelogue of award winning short films. We suggested YouTube might be the best way to display and distribute their work. 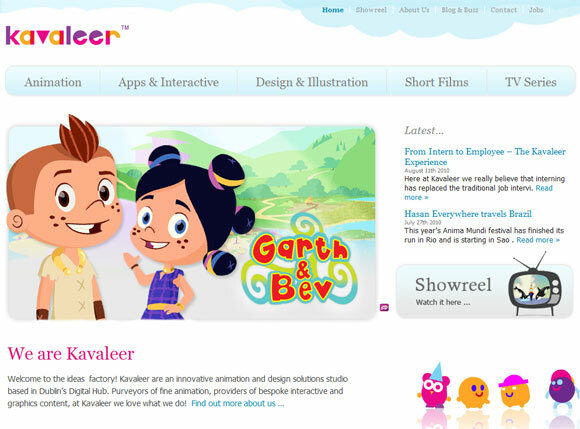 We created two themed channels – one for Kavaleer’s main body of work and another for Garth & Bev the children’s TV series. People can now find work through the website and also through YouTube – the world’s next biggest search engine after Google.